I think it's Middlesex Merit Tables - Division 3. We are in MMT3 and (for anyone interested) having a decent season. We started with 4 big wins (average of 60+ points per game) which left us top of the league but vying with an equally dominant Hammersmith & Fulham team. Week 5 we had a closer win but still a bonus point. Hammers seemed to drop a point leaving us top. We played round 6 on Saturday just gone and beat Quintin who started the day in third. However we missed the bonus and so have dropped our first point of the season. Hammers got another big win so we are currently 2nd on points difference. This Saturday we play Hammers in a top of the table clash and follow that up with a match against Belsize Park (now in third) on the 17th. More with the pro club rather than the pro players. To be fair we are probably at too low a level for the pro players to notice us! 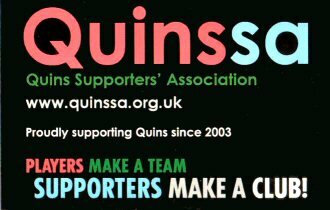 Since David Ellis came in, he’s strengthened the link so our coaches all come from the community team and our DoR is one of the Quins Ladies’ coaches. We also had Jim Evans down for a line out session a few months ago. The spin off from that is that we have had the opportunity to attend pro training sessions and our annual game at the Stoop has been happening much more regulalry in recent years. As part of the 150th there was a strengthening of the identity as one club so since then everyone from u5 to vets wears the same kit as the pros. Plus our club president is still Bob Hiller and this Friday, a load of us will be going to the annual Harlequin Players Association lunch. The top of the table clash yesterday ended in a 27-24 victory to Quins Ams leaving us clear of Hammers at the top of the league. And after a week off, the Ams we were back in action yesterday against Belsize Park IV. Belsize started the game in 3rd, close behind H&F so were definitely a potential banana skin. Final score Quins 24 - 18 Belsize. 8 from 8 with 6 bonus points. Next weekend is a cup quarter final against Old Streetonians IIIs. No wonder you beat 4 of them! Well Deadly, there were even fewer of them this week. Cup weekend as mentioned and the Ams beat a much improved Old Streetonians III 29-5 to advance to the semi finals.